As you knock those cities off your bucket list, take in a masterpiece or two and make 2018 a year of adventure and enrichment. Johannes Vermeer’s luminous portrait of a domestic servant hangs in Amsterdam’s Rijksmuseum. The serene image is one of only 34 paintings attributed to the celebrated Delft artist, whose unparalleled attention to detail enlivened his aesthetic with a remarkable photographic quality. 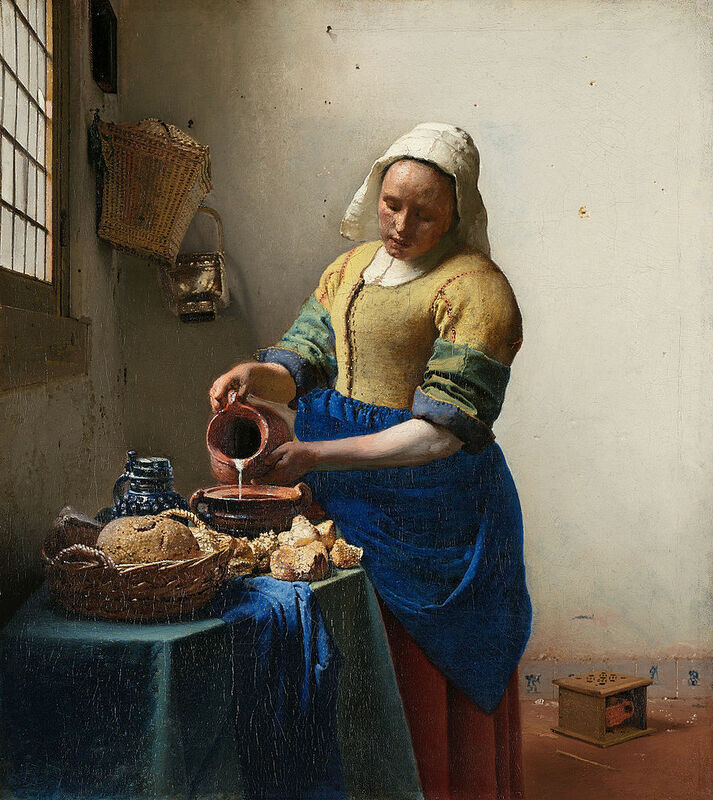 Painted in the mid-17th century, The Milkmaid (c. 1660) is a must-see masterpiece in a city overflowing with art history. Vincent van Gogh. The Starry Night. Saint Rémy, June 1889 | Courtesy of The Museum of Modern Art, New York. Acquired through the Lillie P. Bliss Bequest. Though letters written by the troubled artist speak of this painting with relative disregard, The Starry Night (1889) is arguably Vincent van Gogh’s most celebrated image. This charming, sleepy scene, on permanent view at the Museum of Modern Art, was painted from within a French insane asylum following the pivotal psychotic break that led to van Gogh severing his own ear. The painting is not only a visual masterwork; it also contains a fascinating secret. Gustav Klimt’s timeless double portrait hangs in the Österreichische Galerie of Vienna’s grand Belvedere Palace, where the largest collection of the famed Austrian symbolist’s work is held. Bearing the geometric characteristics of Art Nouveau in harmony with organic embellishments popular in the earlier, 19th-century Arts and Crafts movement, The Kiss (1907–1908) was painted at the height of Klimt’s “Golden Period,” and remains one of his most exquisite paintings. Frida Kahlo painted The Two Fridas (1939) following a tempestuous divorce from fellow artist and revolutionary, Diego Rivera. On view at Mexico City’s Museo de Arte Moderno, the artist’s double self-portrait depicts her Mexican and European heritage, separated by form and dress yet intertwined in hand and heart. 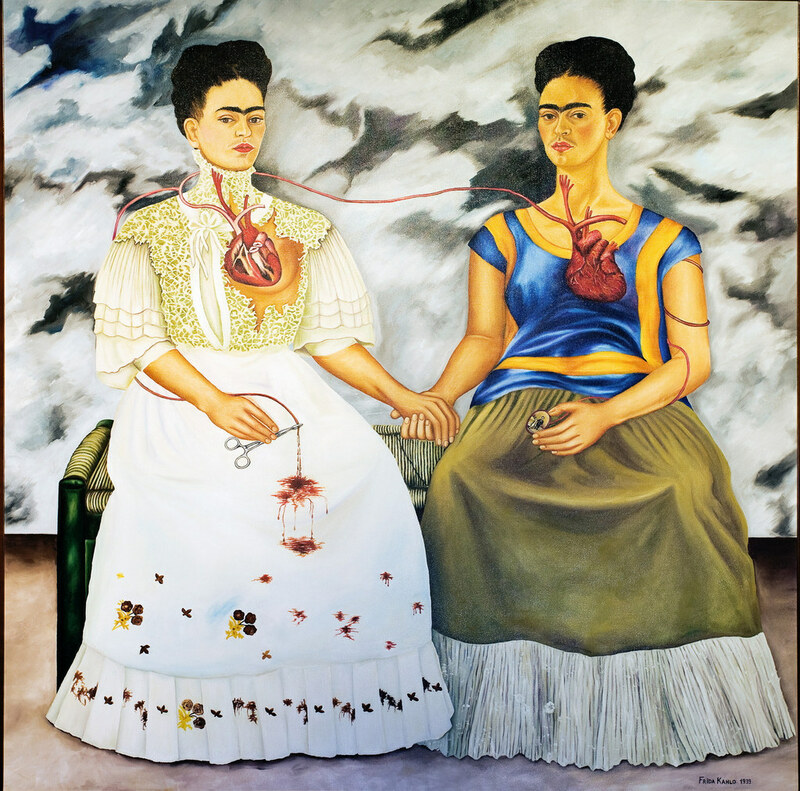 The European Frida (on the viewer’s left) bleeds from a wounded heart onto her dress, likely in reference to her former husband’s particular adoration of her Mexican identity. The legendary Spanish cubist Pablo Picasso’s jarring depiction of wartime casualties is housed within Madrid’s Museo Nacional Centro de Arte Reina Sofia. 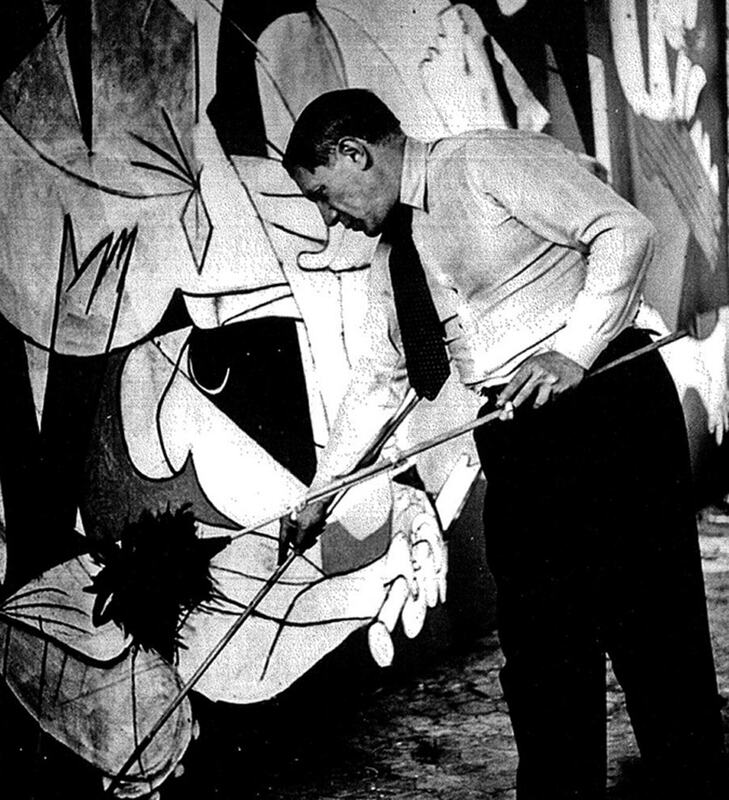 The painting was inspired by newspaper photographs revealing the aftermath of a German aerial bombing in the Basque town of Guernica, though the piece is said to portray the general horrors of human conflict over the specifics of this particular event. The subjects’ harrowed fragments and tormented facial expressions convey extreme panic, while the muted color palette suggests the blinding despair of war. 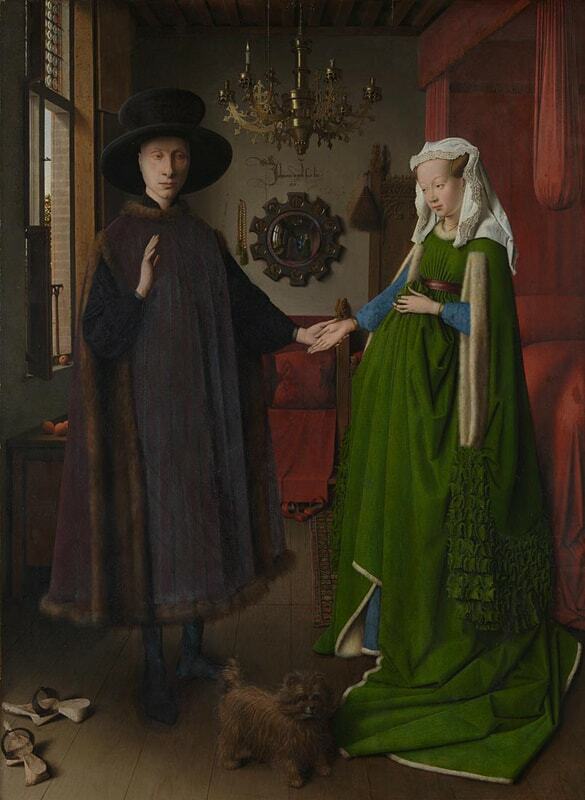 Early Netherlandish painter Jan van Eyck famously depicts the merchant Giovanni di Nicolao Arnolfini with his wife in this masterly double-portrait. On view at The National Gallery in London, van Eyck’s luminous composition showcases the shimmers and textures of the scene in exquisite detail. The couple is also not alone—in the background, between the subjects’ outstretched arms, is a mirror that reflects two additional figures. Just beneath the chandelier is a Latin tag that reads “Jan van Eyck was here in 1434,” suggesting that The Arnolfini Portrait (1434) is also something of a sneaky self-portrait. 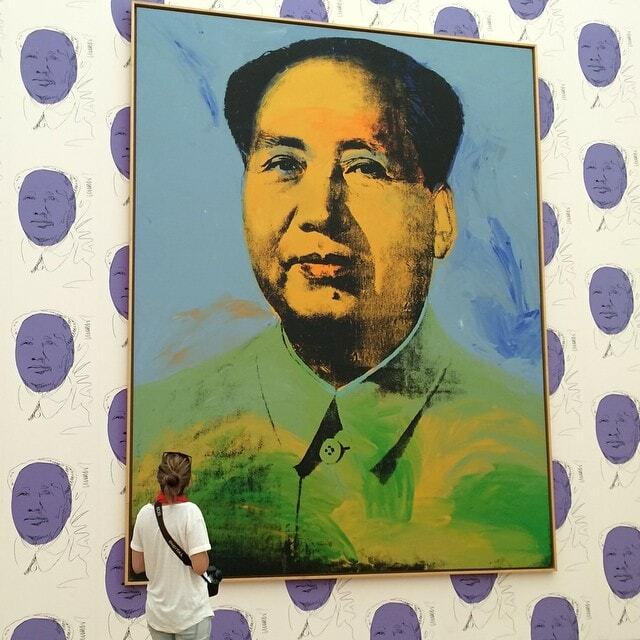 One of Andy Warhol’s famous portraits of Mao Tse-Tung can be found in the Kleihueshalle of the Hamburger Bahnhof, Berlin’s premier museum for contemporary art. The pop artist’s portraits of the Chinese Chairman are amongst his most iconic. A large-scale painting in blue and green, the Hamburger Bahnhof’s edition of Mao is a striking highlight of this must-visit museum. 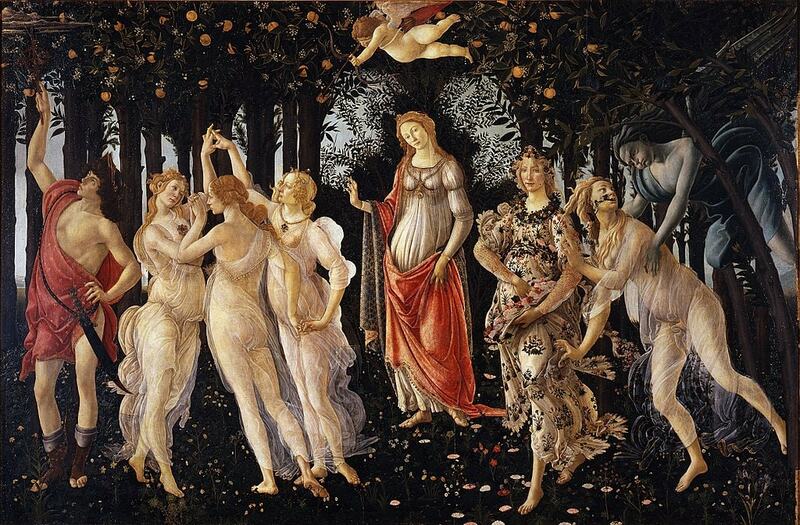 Sandro Botticelli’s jubilant springtime painting is a botanical dream; horticulturists have identified some 500 real plant species worked into the composition amid ethereal damsels and mythological deities. The stunning allegorical painting, created between 1477 and 1482, hangs in Florence’s Uffizi Gallery, and stands as a keystone of Italian Renaissance art. 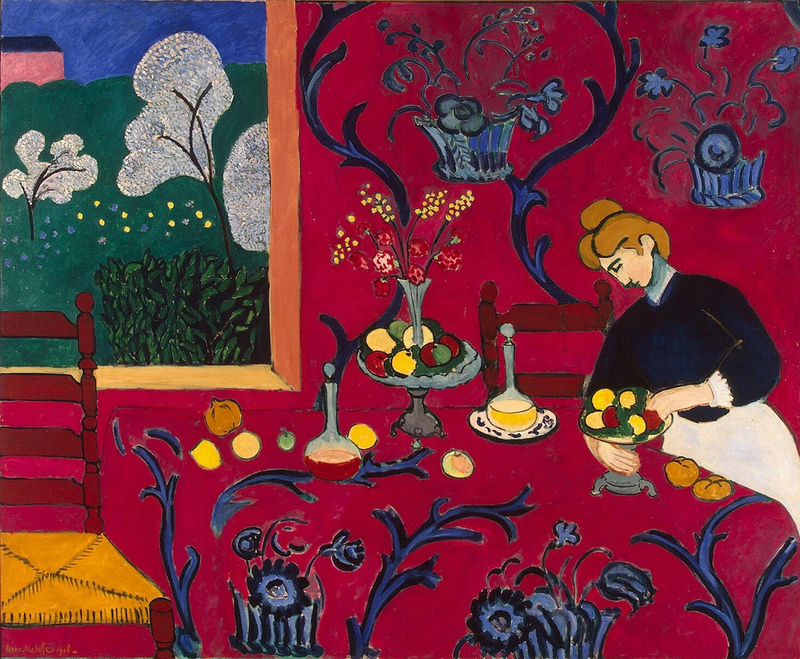 The Dessert: Harmony in Red (1908) is one of fauvist painter Henri Matisse’s richest compositions. On view at the Hermitage Museum in St. Petersburg, this bold painting was originally created as part of a decorative panel for Russian collector Sergey Shchukin’s dining room, but it quickly garnered notoriety as a fine art masterpiece. When you (temporarily) tire from viewing the innumerable old-world masterpieces across Paris, visit the Centre Pompidou to take in a modern marvel. Mark Rothko’s Untitled (Black, Red Over Black On Red) (1964) is one of the color-field artist’s most arresting. 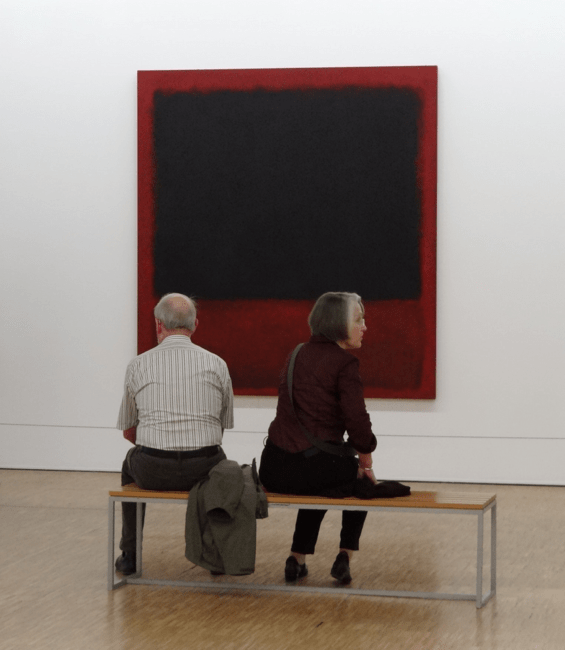 Rothko’s work is spiritually exalting, but his experimentation with a darker palette affords a deeply reflective, moving experience. Edvard Munch, ‘The Scream’ (1893). Photo: The National Museum / Børre Høstland. Edvard Munch’s The Scream (1893) is not only the Norwegian artist’s most recognizable artwork, it’s one of the most famous images in art history. 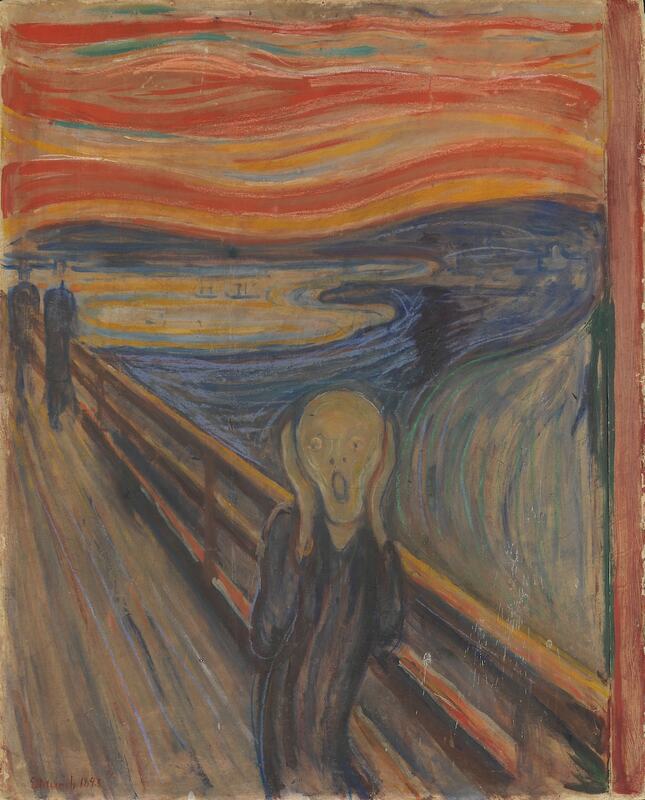 On view at the Nasjonalmuseet in Oslo, The Scream is an emotive and perplexing masterpiece that no trip to the Norwegian capital should go without.